Las Vegas, Nevada. January 23, 2018 – Visitors at the West Coast Art and Framing Expo (WCAF) this week are experiencing the biggest evolutionary leap in conservation glass since UV filtering. VariGuard, a business unit of Research Frontiers Inc., is exhibiting its SPD-SmartGlass framing products at Omega Moulding’s booth #431. 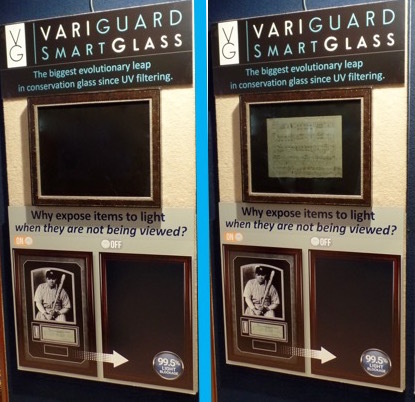 Conservation glass only protects items against fading from UV exposure but offers no protection against light exposure. The inability of conservation glass to protect against light exposure limits its effectiveness against fading damage. The Canadian Conservation Institute states that “UV usually contributes less than half of the fading and often only one tenth…To reduce the fading…there is only one option: reduce light exposure.” VariGuard SmartGlass is the only product in the marketplace to effectively solve this problem. VariGuard SmartGlass, in light-blocking and clear states, at 2018 WCAF.